Chris Bosh registered a double-double with 23 points and 11 rebounds in the Miami Heat's Christmas Day victory over the Los Angeles Lakers. LOS ANGELES (AP) — The Los Angeles Lakers missed having Kobe Bryant out on the court on Christmas Day. Same for LeBron James. Playing without its biggest star, Los Angeles stayed right with the Miami Heat for most of the day before slipping to a 101-95 loss against the defending NBA champions on Wednesday. Chris Bosh and Dwyane Wade had 23 points apiece, and James added 19 points in the Heat’s sixth straight win. Bosh grabbed 11 rebounds and Ray Allen made four 3-pointers for 12 points, helping Miami improve to 5-0 against the Lakers on the holiday. "I knew we would get a good game out of them, and I think the NBA wanted a good game," James said, noting the blowout results of the first two games on the league’s holiday schedule. Bryant was relegated to the sideline with his fractured left knee, leaving him unable to extend his NBA record for Christmas Day appearances to 16. "It’s not as special when Kobe’s not out there," said James, who shared a post-game hug with Bryant. Streaky reserve Nick Young scored 20 points for the Lakers, who were tied four times in the fourth quarter. Jodie Meeks added 17 points, Xavier Henry had 14 and Pau Gasol added 13 points and 13 rebounds. Miami shot 51 percent from the field while improving to 7-0 against the Western Conference this season. It was its 19th straight win overall against West opponents. Bosh scored 13 of his 23 points in the first half, when Miami trailed 27-21 after the first quarter. "I just made an effort to get to the basket a little more," he said. "We just kept wearing on them offensively. They made some tough shots." Los Angeles shot 42 percent in its third straight loss. The Lakers were 14 of 36 from 3-point range as they tried to go over the top to beat the Heat’s rugged interior. "Teams will try to get us moving and play out of our rotations," Heat coach Eric Spoelstra said. "Early on they were getting some wide-open ones. Some of those Nick Young hit were tough." "I hadn’t even played 5-on-5 since I got hurt, so this is the first time I’ve actually played basketball," he said. "Health-wise, everything stayed intact and I felt good out there, so it’s progress." The Lakers played a competitive game against the loaded Heat despite their poor shooting and the absence of Bryant, Steve Nash (nerve root irritation) and Steve Blake (right elbow). They led by 10 points and never trailed by more than that. "I thought we attacked them the way we wanted to," Lakers coach Mike D’Antoni said. "We can step it up a bit and be a little bit tougher, especially on the boards and places like that. Those things are irritating, but the effort is good." Young’s basket tied the game for the last time at 83-all. The Heat promptly took off on a 13-5 run. Wade, Norris Cole and James scored all of the Heat’s points. Young scored 12 points in the third, when the Lakers trailed by nine before scoring the final seven points of the period, capped by Young’s 3-pointer, to trail 76-74 heading into the fourth. Allen and Wade combined to score the Heat’s first 13 points of the second, with Allen hitting 3-pointers to bookend the run and pull the Heat into a 34-all tie. Bosh took over and scored 10 points in a row, including a layup that gave Miami just its second lead of the game, 40-39. 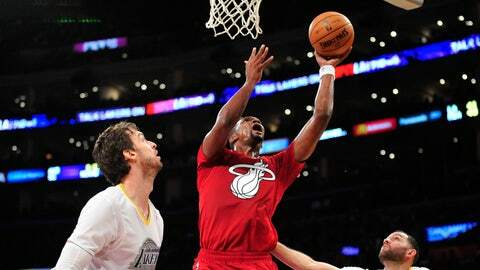 James interrupted Bosh’s offensive spurt with a one-handed dunk off Wade’s fast-break alley oop. "Any time Dwyane gets on the break I try to chase him down," James said. "I didn’t know what he was going to do. The only way I can catch it is with my left (hand). I just tried to improvise. I got to see it again." NOTES: Heat F Chris Andersen didn’t play in the second half after his back tightened and his neck became sore. … The Lakers played for the 40th time on Christmas and fell to 21-19, including 13-10 at home. … Miami improved to 8-2 on the holiday, including 5-2 on the road. … The Lakers used their 14th different starting lineup through 29 games. … The teams played with sleeves on their jerseys. "Every time I shot I felt a little tug," James said. … The Heat wore a mix of holiday-themed red and green shoes, some with touches of glitter. Some of the Lakers wore green-soled shoes. … Bryant got up and hugged Samuel L. Jackson during a timeout in the second quarter. Jack Nicholson, Kevin Hart, George Lopez and Dyan Cannon were among the other celebs in attendance.